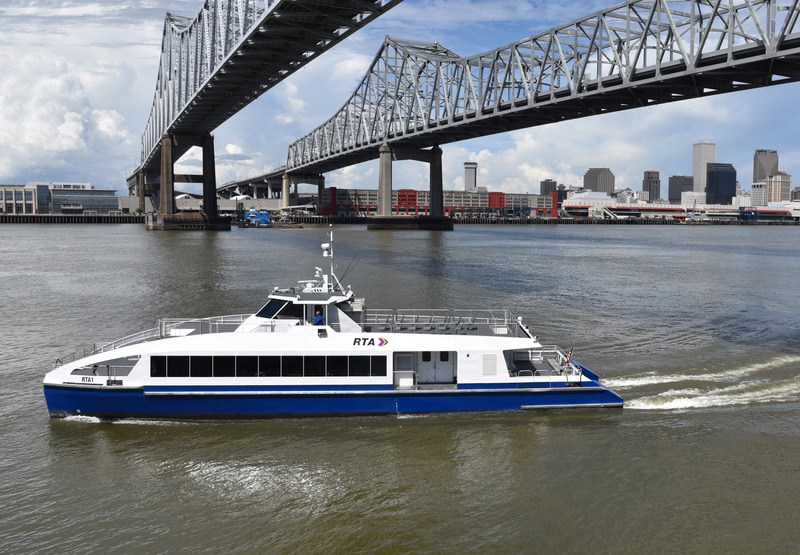 Jeanerette, LA – November 12, 2018: Shipbuilder Metal Shark is pleased to announce that both new 105-foot, 150-passenger, high speed aluminum catamaran passenger ferries constructed for the New Orleans Regional Transit Authority (RTA) have been completed and are ready to enter service. Metal Shark is a diversified shipbuilder specializing in the design and efficient high quality construction of welded aluminum and steel vessels from 16’ to over 300’ for defense, law enforcement, and commercial operators. Key customers include the United States Coast Guard, Navy, Air Force, Army, foreign militaries, law enforcement agencies, fire departments, passenger vessel operators, pilot associations, towboat operators, and other clients worldwide. Metal Shark offers a broad portfolio of globally proven hull designs that may be fully customized thanks to 100% digital design and an in-house team of over 50 naval architects and maritime engineers. With three fully self-contained shipbuilding facilities in Alabama and Louisiana spanning over 75 total acres, Metal Shark’s 500+ employees produce over 200 vessels per year with a proud and proven track record of high quality, on-time deliveries. Metal Shark Completes New Orleans RTA Ferries 1 and 2 from Metal Shark Boats on Vimeo.